Marketing Information : The most popular desktop UPS in the world! The Back-UPS ES BE750G offers our best value for protecting your home and home office computer systems. 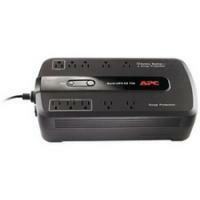 It provides battery backup power that allows you to work through short and medium length power outages. It also safeguards your equipment from damaging surges and spikes that travel along your utility and phone lines. Award-winning software automatically shuts down your computer system in the event of an extended power outage. Additional features like audible alarms, an LED status indicator, user replaceable push-button circuit breakers and transformer-block spaced outlets make the Back-UPS ES BE750G the perfect unit to protect your productivity from the constant threat of power outages and lost data.